​Propofology content continues to be in the top influencers list of #FOAMed and #FOAMcc (Critical Care) on social media. (Free Open Access to Medical Education) to everyone involved in anaesthesia, critical care and pain medicine. The website focuses on delivering ‘infograms’ and visual abstracts on topics pertinent to these fields; aiming to distill complicated topics into short ‘bytes'. There are nearly one hundred infographics to peruse and learn from. Another main pursuit is the YouTube and Vimeo channels which covers a wide variety of content. ​Most of the content is also disseminated on Twitter to the #FOAMed network, which is free and open access. Particularly useful for those working in anaesthesia, ICU and critical care, but also those revising for examinations and medical school. It is for all practitioners, not just doctors. There is also a separate, paid course in anaesthesia which is distinct from the #FOAMed content that tends to focus on Clinical Critical Care. The infograms can be redistributed so long as they are unaltered and you let me know for my records! The #FOAMed movement is based on discussion... so... discuss! Feel free to contact me on twitter. If you have material to contribute, I would love to hear from you! I am a Speciality Doctor in Anaesthetics and Intensive Care Medicine working in Hepatobiliary Theatres and a city centre ICU. ​My main academic interest is medical education; I love teaching. I am a medical school examiner and an honorary clinical tutor to final year medical students. It is my ambition to show the benefit of social media and online-learning to all healthcare professionals. My interest in medical education began in 2009, I co-founded the HYMS Prehospital Care Programme in Yorkshire and was its academic forum lead for two years before moving back to Northern Ireland. Since then, I have been on faculty for various local courses before joining the Faculty of International Fluid Academy as well as the European Society of Intensive Care Medicine, the largest ICU organisation in Europe. Most recently (Oct. 2018) our collaborative won a poster presentation at #LIVES2018, with 6500 attendees on the voices of AHP's and Nurses in Critical Care Social Media. I was also lucky enough to be invited to speak at IAEM in Dublin 2018 on the Top 5 Papers in Critical Care. Most of the content I make and signpost covers anaesthetics, critical care and pain medicine, but this material is widely applicable to all specialties involved in the care of the acutely unwell patient. It is aimed at providing discussion points rather than being a definitive reference. I am fortunate enough to collaborate with wonderful practitioners across the world. I have worked with specialists across the UK to gather their contributions to the infographs, doctors from New York to develop and promote the exciting CERTA concept of analgesia and with Dr. Gonzalez of Chile to work on making the infographs available in Spanish. My most recent projects include a Fluid Protocol with Dr. Jonny Wilkinson in Northampton and Faculty Material for The International Fluid Academy in Belgium with Prof. Manu Malbrain. I also create summary infographics of key trials within the specialties. After passing my Primary FRCA MCQ paper, I decided to set up a Primary FRCA Course in Basic Sciences on Vimeo - reflecting how vital different formats of knowledge acquisition are vital for adult learners. In 2018, I set up QuickMedic.net - an online course for Final Year Medical Students reflecting the work I undertake with final year medical students on the cusp of becoming doctors. As a team, Dr. Adrian Wong, Dr. Gorki Sacher, Dr. Matt Rowland, Dr. Jonny Wilkinson, Dr. Segun Olusanya and myself form the core faculty for COSMICC which is a group working to create new educational resources in Critical Care Medicine... watch this space! Most of these guidelines cover the potential use of information by patients. I will state again - the information on this website IS NOT FOR PATIENTS OR THEIR FAMILIES. IT IS FOR MEDICAL PROFESSIONALS ONLY. 68. You must be honest and trustworthy in all your communication with patients and colleagues. This means you must make clear the limits of your knowledge and make reasonable checks to make sure any information you give is accurate. This website is not for patient use; only healthcare professionals and healthcare students. There is no patient-doctor relationship offered or made. I make reasonable checks to ensure the information in each educational resources is accurate but like most clinicians I do not consider myself a definitive expert in all the areas I teach - you should always try to gain as wide a variety of opinions as possible. I also rely on you to let me know of any error or omission to help prevent any misinformation. The content provided on this site is covered by this disclaimer. The information provided by anything pertaining to propofology.com should not be used to treat patients. You should use it as 'information only'. 69. When communicating publicly, including speaking to or writing in the media, you must maintain patient confidentiality. You should remember when using social media that communications intended for friends or family may become more widely available. This website does not broadcast patient identifiable information, nor promotes material that does. Should you find anything on this website that contravenes this, please let me know immediately and it will be removed. 70. When advertising your services, you must make sure the information you publish is factual and can be checked, and does not exploit patients’ vulnerability or lack of medical knowledge. This website is not for patients, only for healthcare professionals and students. The information published usually has cited sources and signposts. Drug doses given in the resources must never be used before checking them properly in a local formulary. There are no services offered to patients in any way. Please see the disclaimer. If you find something in any of the infograms that you feel is inaccurate or you don't agree with it - please contact me directly either via email, or on twitter. All the graphics are easy to update/amend. By contacting me, we can all learn something new! 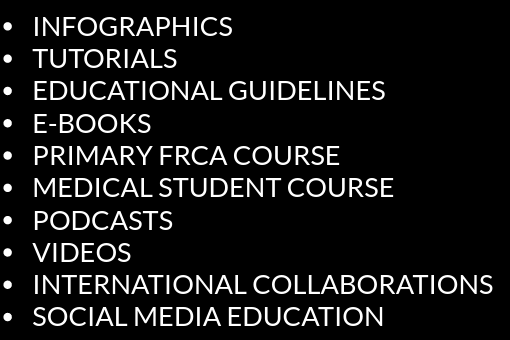 ​#FOAMed content was never meant to be a definitive reference, but rather a conversation. The concept of real-time peer review via the #FOAMed community is well known. Support this process by pointing out issues and expressing your opinion about the material contained within all #FOAMed content. The contributors to the movement are expecting this and are not easily offended with academic process or debate! This improves further content, helps everyone understand the relevant issues more clearly and is vital for the success of the #FOAMed movement. You may see google advertisements on this website; these are placed in an attempt to recover some of the running costs of the website. The advertisements are not personally endorsed by me or any other contributor to the website. It goes without saying that this website and blog represents my own personal views and not those of my employer or their affiliates. I also do not seek to represent the opinions of those who I 'retweet' or link on the site. THIS WEBSITE IS NOT FOR PATIENTS. For patients, none of the material, opinions or commentary found on this website constitute medical advice in lieu of seeking counsel with a professional doctor. All educational material should be used in concordance with your local health care policy and hospital guidelines. Drug doses must be checked in a local formulary (they can vary from place to place) and you must also have a license to administer/prescribe such medications. The authors of the content accept NO responsibility for dosing errors. Having such a license does not give you the experience to administer any medication/treatment and anticipate the sequelae. Consult your senior colleagues and discuss management plans - do not rely on this website or any blog/educational service to create unorthodox treatments for your patient(s). This is a particular warning to junior staff if practicing medicine under vicarious liability of a consultant/senior doctor - some things may not be suitable and could even harm those you care for. Myself and the authors featured on this website take no personal responsibility for your actions if you base them on the educational material within, without appropriate safeguards. Be safe, speak to a senior and discuss your treatment plans. Everyone who uses, prints or distributes the infograms or materials on this site agrees to what is outlined in the full legal disclaimer, above.